"In an internet petition, or "there ought to be a law" way"
When you are trying to get on stage at the Myra Stump talk show, Sam is asked if he is famous. He replies that they are perhaps famous "in an internet petition, or "there ought to be a law" kind of way". 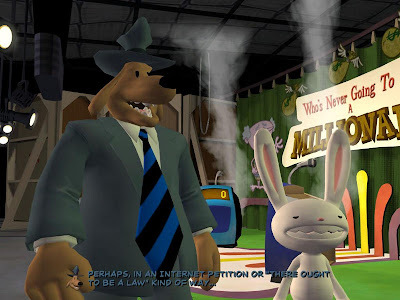 This is most likely a reference to the petition to LucasArts to bring Sam & Max: Freelance Police back into production.